I begrudgingly became captain of this kickball team I play with at work. I mean, Begrudgingly with a super capital B. I don’t know how to play kickball plus I can barely get my dog to listen to me, how was I supposed to be a captain? However, the only thing I had going for me was my knack for administrative efficiency (or my control freak tendencies ..but that doesn’t sound so nice). Administratively efficient. A term someone came up with as a nice way to say I’m really good at paperwork. Which is true. Growing up I aspired to be a great secretary (much to the dismay of my father), because I was good at organizing things and thrived in the supportive role. Which is still very much true today, but as an engineer (dad is much more at peace with this). So I did it. I pulled a team together, hassled people for money (working on my loan sharking skills), got us registered, paid up and picked a team name and color, all in the nick of time. Administrative efficiency…hard at work. I hope they appreciate this…..
And I hope you guys appreciate a good ice cream sandwich (I know I always do!)! 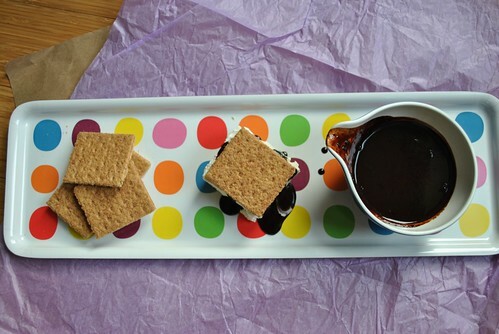 S’mores usually consist of three parts: Graham cracker, chocolate and a campfire toasted marshmallow. 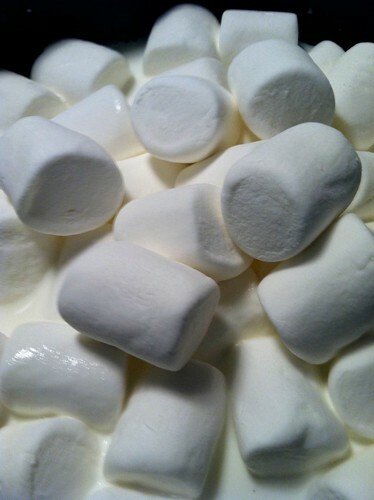 In a medium-largeish sized saucepan, combine the half +half with the marshmallows and cook over medium heat until the marshmallows are all melted. Stir frequently. Remove from heat and let it sit for a few minutes, then transfer into a large bowl, cover and place in fridge until chilled through. This takes longer than the 30 minutes stated in the original recipe. I would keep it in there for at least 1 1/2 hours, or until the mixture is cool to the touch through the bowl and it has slightly thickened. I actually ended up throwing mine into the freezer for 15 minutes then giving it a good stir and back in the freezer for another 15 minutes. It was Monday night, I did not think this through. Once the mixture is chilled, pour the heavy cream into the bowl of a mixer and with the wire whisk attachment, whip until you get soft peaks. 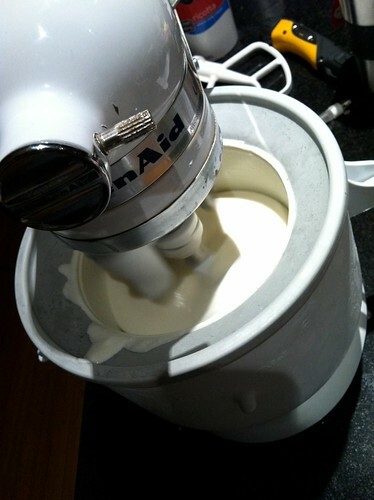 Fold the whipped cream into the chilled mixture and assemble your ice cream maker! Churn according to manufacturer’s instructions. 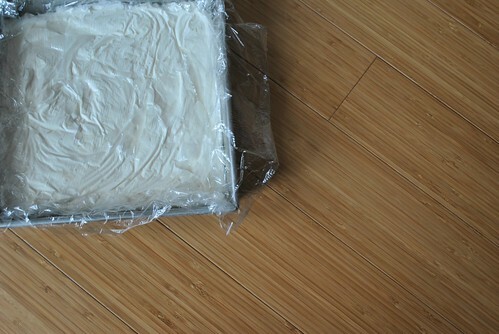 While it’s churning, line an 8×8 square baking pan with plastic wrap. Once the ice cream is done, dump into the pan and smooth out the top of the ice cream. Cover with plastic wrap such that the plastic is against the top of the ice cream, and place in the freezer to set up. Give it a few hours, overnight is best. I ended up making only a quarter of what the original yield was. In a small pan combine: 1/4 cup of water + 25g sugar (about 1 1/2 tablespoons) + 40g light con syrup (not diet corn syrup…watch your labels, about 3 tablespoons-ish) + 25g dutch processed cocoa powder (heaping spoonful). Bring mixture to a simmer while stirring frequently. Remove from heat and mix in 14g of semisweet chocolate, chopped fine or just broken into small pieces with your hands (this is one square if using Ghirardelli). Once the chocolate is all melted, transfer to a bowl and let sit until cooled and slightly thickened. Take a graham cracker square (I had cinnamon graham crackers on hand) and carefully dip one side into the chocolate sauce. Take the ice cream out of the freezer and uncover. 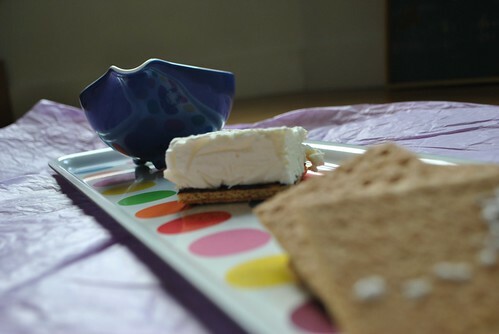 Cut out a piece about the size of the graham cracker and place the ice cream on top of the chocolate side of the graham cracker. 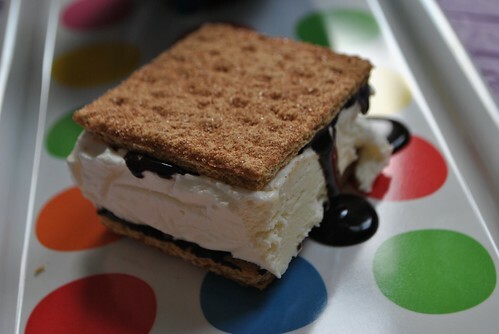 Pour some chocolate sauce on top of the ice cream and cover with another graham cracker. I don’t know why, but I feel like my ice cream didn’t taste that much like marshmallows (kinda did, just not very much so). It made for a great plain vanilla ice cream though. Maybe it was because I ate two marshmallows out of the bag, and therefore didn’t use all ten ounces. Or maybe it was because I got nervous pouring the mixture into the ice cream maker, and stopped at one point because it looked too full, and therefore didn’t use all of the mixture. I think it’s because I ate the two marshmallows…. This is messy to eat. Homemade ice cream melts faster. So don’t eat it on the floor otherwise you will drip chocolate sauce down your favorite sweatshirt (only something I would do). 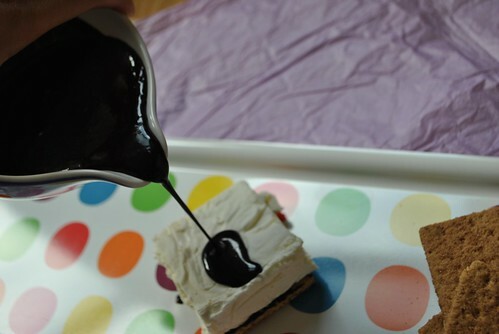 The chocolate sauce is totally amazing. Without all the butter and cream I had to use when I first tried to make chocolate sauce, this felt much lighter and more chocolate-y. It was a snap to throw together to boot! Goes well with fruit! 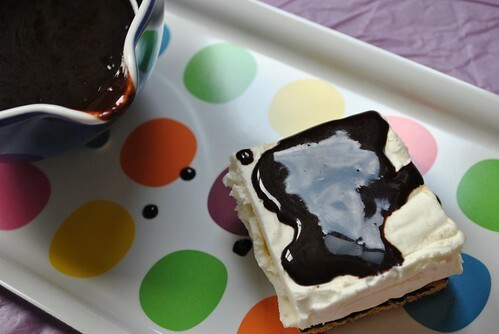 This entry was posted in Dessert, Sandwich, snack, Uncategorized and tagged 52kitchenadventures, chocolate sauce, David Lebovitz, ice cream sandwich, Kickball, Marshmallow, S'mores. Bookmark the permalink.